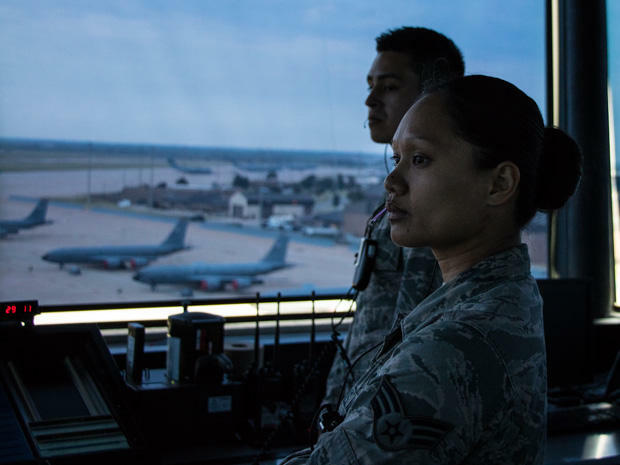 Trainees in the control tower at Altus Air Force Base watch as a C-17 cargo plane taxis to the runway. 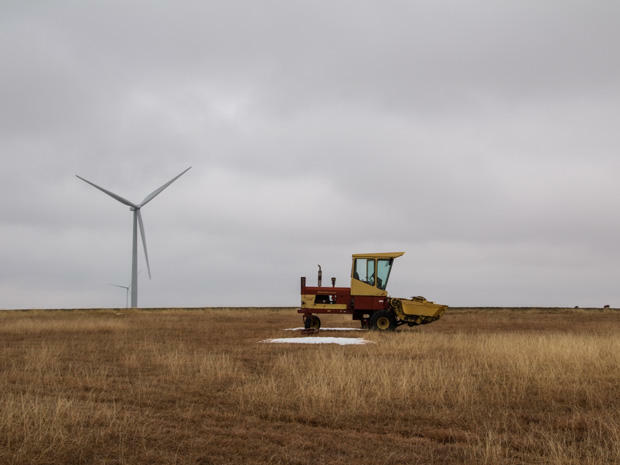 Developers recently announced plans to build the country’s largest wind farm in Oklahoma’s Panhandle. The industry is growing and turbine projects are expanding across the state. But wind energy developers are facing a new headwind: military air bases. StateImpact's Joe Wertz spoke to a flight instructor and a wind energy advocate about wind farms. The C-17 is the pack mule of the United States military. It’s designed to lift and transport troops, tanks and even helicopters. It’s an enormous aircraft that casts an ominous, looming shadow as it taxis to takeoff. Every U.S. C-17 pilot is trained at the Altus Air Force Base in southwestern Oklahoma. Flight instructor Adam Bergoo says a key part of that is teaching rookie pilots to fly close to the ground. “That’s one of our military missions is to fly low-level because that basically reduces the risk of detection, and getting shot at by the bad guys,” he says. The western part of Oklahoma is an ideal place for military flight training because the skies are wide open — or, at least they used to be. One of Bergoo’s training routes is now partially blocked by a wind farm. 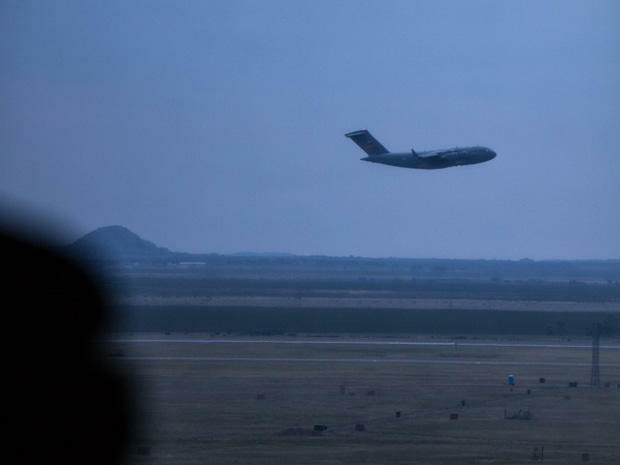 A C-17 shortly after taking off at Altus Air Force Base. New wind farms are threatening other flight training routes, too. Top brass at Altus and Vance Air Force Base near Enid, where pilots are trained to fly smaller planes, are sounding the alarm with local officials — and Oklahoma lawmakers. And some business leaders are complaining. They want to keep the airspace open to attract aerospace companies and entrepreneurs who need a place to test drones. Oklahoma lawmakers are considering a bill to require new wind farms to get approval from the state’s aeronautics commission, which is pushing for more oversight. No “specific” accidents or crashes involving military pilots and wind turbines have been reported in Oklahoma, but the commission says base officials are increasingly worried the hazard is growing as wind farms expand. “Several members of the military have echoed concerns of what would happen if an aircraft lost an engine or had a bird strike and they had to eject over or near a wind farm,” says Airport Development Division Manager Grayson Ardies. Oklahoma lawmakers have also discussed requiring the state’s military commission to sign off before new wind farms break ground. The wind industry, for its part, opposes both efforts. “Creating a new state bureaucracy is not the way to go,” says Jeff Clark with The Wind Coalition, which represents wind developers in Oklahoma. Wind farms have run into trouble with military installations in other states. The Department of Defense has blocked projects in North Carolina over concerns the wind towers would interfere with a bombing range and military radar. The Tar Heel State recently barred wind farm permits for 18 months. This year, Texas Gov. Greg Abbott signed a bill to prevent wind industry tax exemptions for any project within 25 miles of an air base. New technology has made turbines and blades more efficient, which means wind farms are going up in locations that companies would have skipped just a decade ago, Clark says. Wind turbines dot the northwestern Oklahoma plains. The wind industry suspects there’s another reason the conflict is gaining momentum. “Anti-wind groups have figured out that this is an issue that they can use to drive a wedge between communities and to raise concern even if those concerns aren’t warranted,” Clark says. Lawmakers who support restrictions dispute this. They say they’re just trying to safeguard military sites. Altus Branch Chief Heath Sirmons, however, says the national security bar is too high. In the control tower at Altus Air Force Base, airmen armed with headsets and computer terminals guide a C-17 onto the tarmac. Once airborne, the trainees will fly for hours, rehearsing approaches. The pilots trained here will deploy to carry critical cargo on missions around the world. Capt. Bergoo, the flight instructor, says the entire country depends on Oklahoma’s open airspace. Once a wind farm interferes with a training route, it’s useless, Bergoo says.